REMINDER : only 12 days left to enter ! There are only 12 days left to enter for a chance to win my first BLOG CANDY...so if you haven't entered yet, you'd better hurry !! 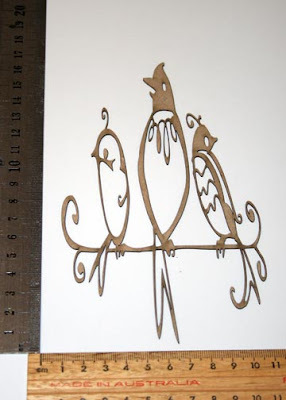 In celebration of the re-opening of my lasercuts blog I would like to offer one lucky reader one of my 'hummingbird & flowers' lasercuts. To enter, please leave a comment on this post. International entries are welcome and the winner will be drawn using a random number generator. Entries close midnight (my time) 12th OCTOBER 2008. Good luck !! You must leave your comments on the original post, which you can find HERE and be sure to leave your email address so that I can contact you if you win ! In the event that the winner has not left their contact details, I will post their name and give them a week to claim their prize. If the winner fails to reply there will be a redraw. 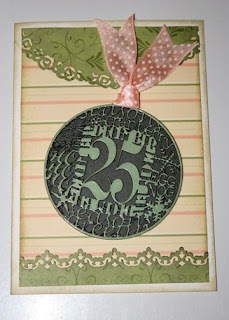 There will be lots more blog candy to give away as I create more designs, so check back often ! And lastly, SCRAPBOOK LADY is having a sale THIS SATURDAY, so if you're in the area pop in and grab a bargain. Twice a year they hold a huge sale to make room for new stock. All the class tables are covered with drastically marked down products, so there's sure to be something for everyone. 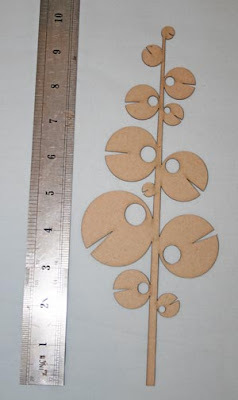 As far as I know, general sales of my lasercuts are going well. 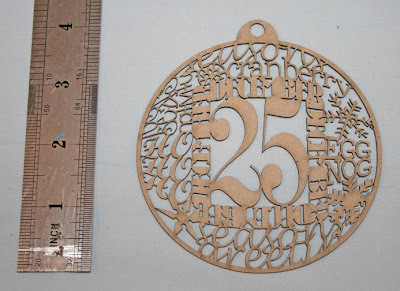 Sharndra tells me that she had received email enquiries within a week of me reopening this blog, so that's GREAT news :) To anyone who has purchased one of my lasercuts, THANK YOU !! I've had a few people ask, and YES - Sharndra will sell and post INTERNATIONALLY so please contact her (via the email link on the right) with your enquiries. How cute do these look ?? 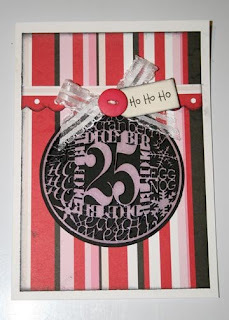 I've just finished playing with some Heidi Grace papers and my brand new Christmas Bauble lasercuts to create these non-traditional Christmas cards. Each bauble was coloured by pouncing a chalk ink pad over the top. Then, to give it some shine, I did the same with my Versamark pad, coated them with some clear embossing powder and then heated the embossing powder to melt. 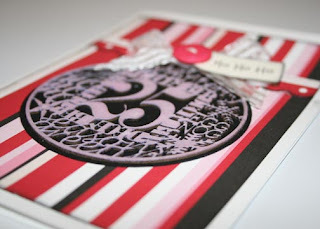 ** Note: when heat embossing lasercuts (particularly fine detailed ones such as this) TAKE CARE not to overheat. 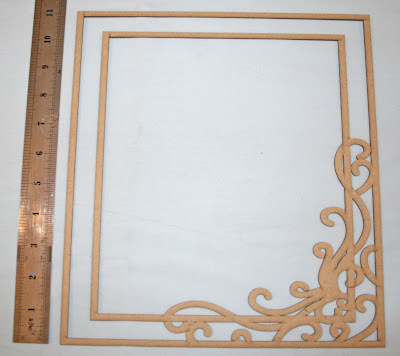 Because the edges have already been burned during the cutting process you will find that those areas begin to smoke. If you overheat it may catch alight. and some gorgeous star-shaped wildflowers. 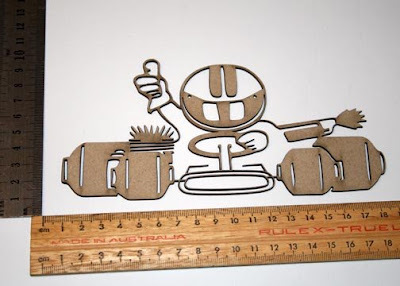 This cute little go kart guy is perfect for all of your boy layouts. What are you doing on Saturday 18th October 2008 or Tuesday 21st October 2008 ? If you're in the Frankston area, why not pop in to the BRAND NEW Spotlight store for a look and to come and say hello to me ? I'll be there from 11am to 2pm demonstrating some fabulous Fiskars tools. I'll have my Ultra ShapeXpress and templates, squeeze punches, stamp press and stamps, one of the new border & corner punches and a FingerTip knife for you all to have a play with. A chance meeting about a month ago presented the opportunity for me to begin my designing again, so of course, I jumped at the chance ! My thanks go to Sharndra & John of Scrapbook Lady, Pakenham. For the past couple of weeks I've been kept very busy working away on my laptop, and here dear readers, are the first of my designs hot off the production line - I hope you like what you see ! Suggestions for new designs are always welcome so don't hesitate to email me if there is something you're after (note; this is not a custom service ~ simply an opportunity to bring a sought-after design onto the market). 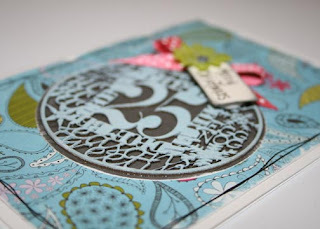 Scrapbook Lady is not an online store, but orders can be placed via email. Please email Sharndra with your enquiries. 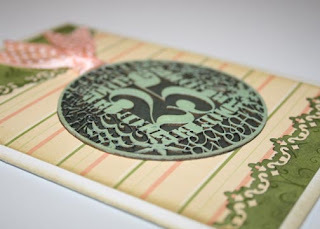 I will be offering random blog candy prizes of some of my designs, so check back often to see what goodies I have up for grabs ! 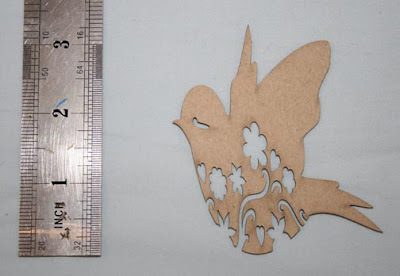 In celebration of the re-opening of my lasercuts blog I would like to offer one lucky reader one of my 'hummingbird & flowers' lasercuts (pic below). To enter, please leave a comment on this post. International entries are welcome and the winner will be drawn using a random number generator. Entries close midnight (my time) 12th OCTOBER 2008. Good luck !! This is my favourite design so far ! 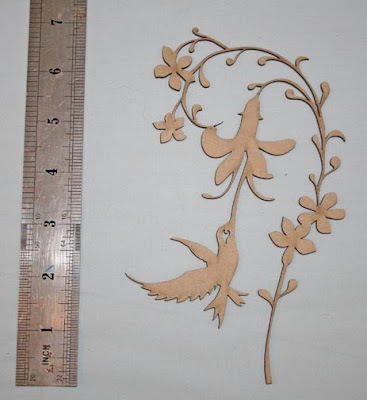 A delicate design featuring a hummingbird feeding from a flower. Two cute little birds sitting on a wire. 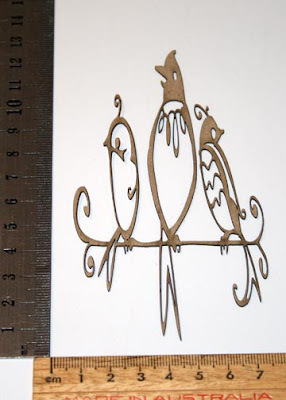 Also available is 3 Birds on a Wire (pic available shortly). 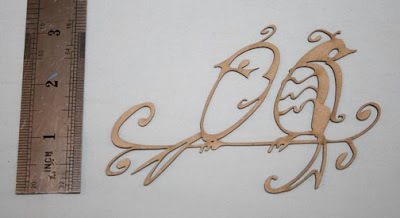 A sweet little bird detailed with scrolls and flowers. 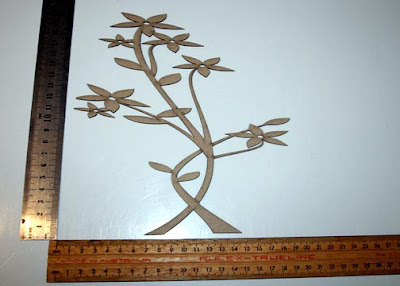 The possibilities are endless for this funky tree ! 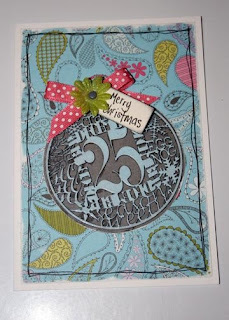 Ink, paint or stain, add glitter, emboss or stamp. Let your creativity run wild with this modern design. 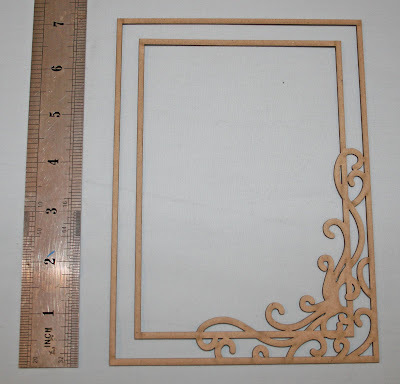 Flip or turn the frame to suit your picture orientation; back with patterned paper or cardstock; ink, paint or stain and embellish as desired. 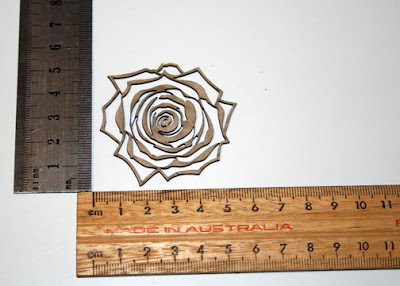 With LOTS of detail, this piece is quite impressive. 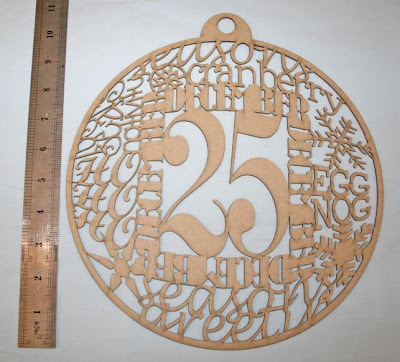 It features a variety of Christmas-themed words and phrases 'written' on a Christmas bauble. 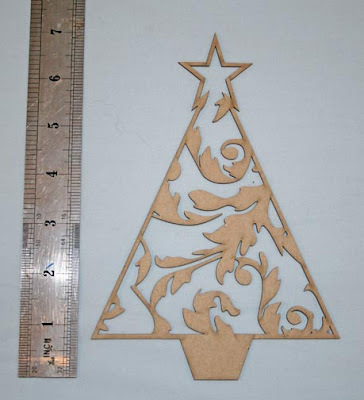 This gorgeous little tree is perfect for all of your Christmas cards, layouts and OTP projects.